It grows slowly, forming in age a mound of thorns and then a narrow column up to 2m tall, with attractive curved spines that partly obscure the yellow, white & green stem. The spine colour is red but also yellow or pale grey. 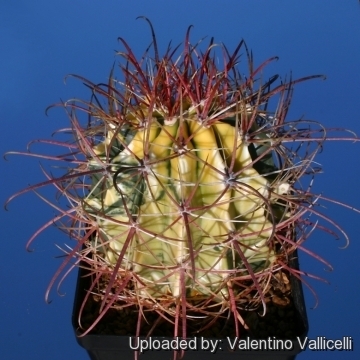 Description: The standard Ferocactus acanthodes (Ferocactus cylindraceus) is a barrel cactus usually unbranched with bright red spines. 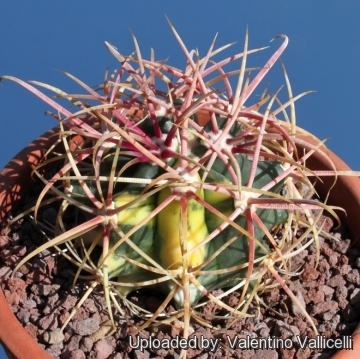 The variegated form (Ferocactus acanthodes f. variegata) has sectors, patches, shades or stripes with yellow colours, even distinct shades of green. Plants with variegated stems are often attractive and highly prized. A very few variegated plants sprout unpredictably time by time among normal green seedling and are very rare. Variegated plants are also found in habitat even though with low frequency, but these plants are particularly sensitive and rarely survive in the harsh environment of their native land. Stem: Green and yellow, spherical becoming columnar with tim column up to 2 m tall and 30 cm in diameter. Ribs: 2,5 cm high and tuberculate. Central spines: A large central spine and three auxiliary centrals form a crucifix shape, The primary central is 7-15 long, angles down and is slightly to moderately hooked, sometimes to 90 degrees. The other centrals are from 5 to 7,5 cm long. The centrals are noticeably ring ridged and flattened, with a flat upper surface and rounded lower surface. Spines can be very light grey to red and yellow, but darken to black with age. Flowers: Yellow tinged with red appear in May and June at the crown of the plant, 4 to 6cm. The fruit with scales is fleshy, yellow or yellowish green, 5 cm long, 2,5 cm in diameter. The flowers on all subspecies are yellow, occasionally with a red tint. 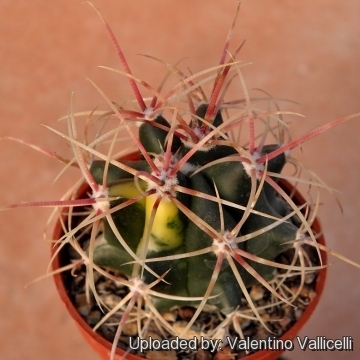 Remarks: Variegated Ferocacti can be found (although not commonly) in cultivation and some of these variegated plants have a place in most collections. All variegates are mutants. Something has gone wrong with the cellular structure of the growth tip (apical meristem) of the plant. As a result of this mutation, chlorophyll is missing from some or all layers of the plant epidermis. The odd variegate appears in many seedling batches in a small percentage and are generally separated from normal plants. Variegated plants grow slower and are generally smaller than non-variegates of the same species. Coloured areas are also generally weaker, and more susceptible to fungus, sunburn and other defects. 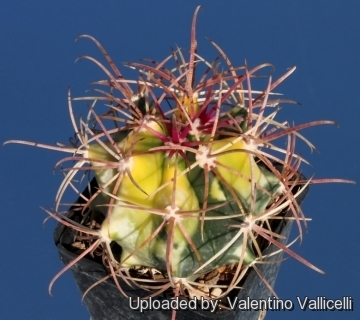 A large well grown variegate Ferocactus is truly an achievement. These are harder to grow well than they appear. 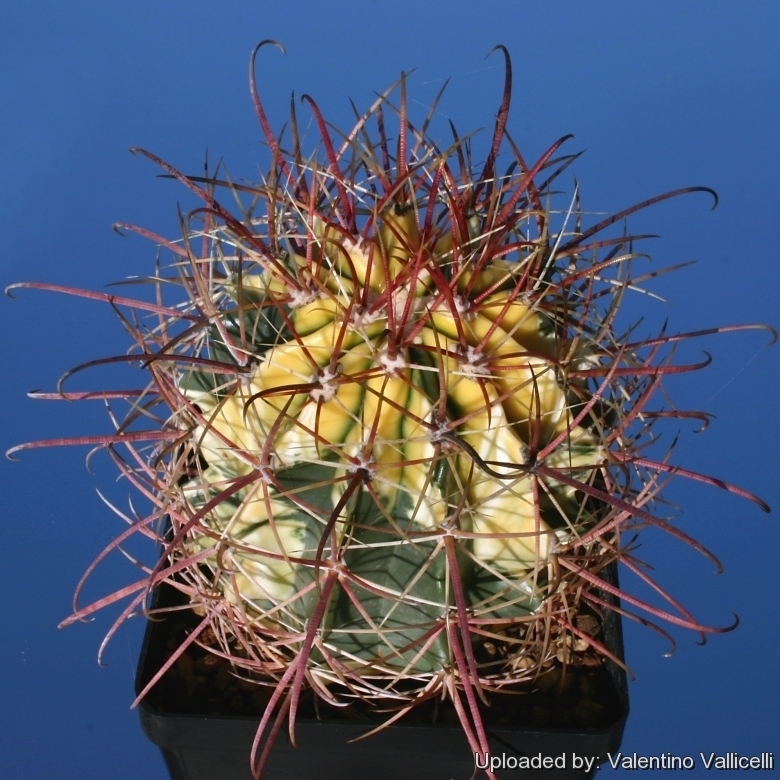 Notes: Ferocactus acanthodes is highly variable and has numerous synonyms. Propagation: Seeds are the only way of reproducing. Seeds from variegated parents often give raise to some variegated seedlings too.